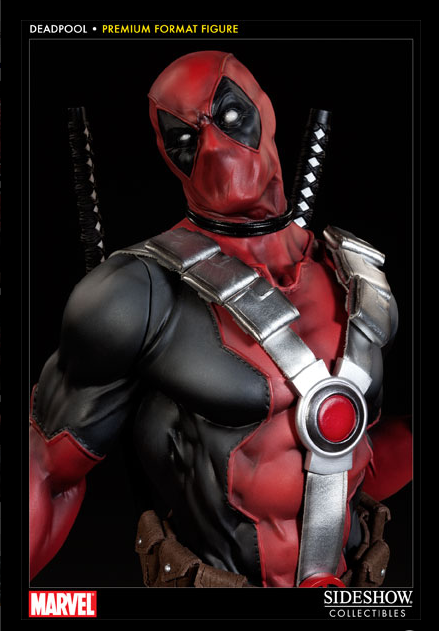 Sideshow Collecibles has unveiled their latest Premium Format Figure featuring Deadpool. 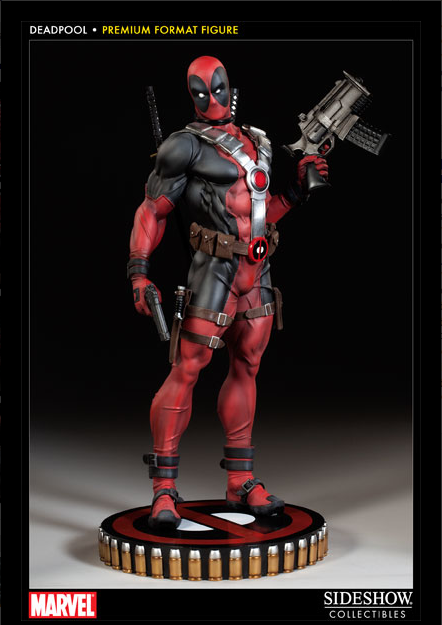 This is a must own statue for any fan of Deadpool... if you can afford the $350 price tag. If you're like me and you can't afford that, then at least we can bask in the glory of these wonderful photos! Do you think you'll be getting yourself one of these badboys!? The history of Wade Wilson, the man who would become Deadpool, is as mercurial as the man himself. He's a hyperviolent contract killer with a flair for the bizarre. Overloaded with weapons both edged and ranged as well as a healing factor that makes him practically unkillable, he's an unstoppable opponent with a chronic case of schizophrenia. He's turned his mental illness into a (frequently hilarious) asset, as his subsequent instability translates to a maddening unpredictability. Initial interactions with Deadpool are frequently met with guarded skepticism, as no one can tell if his presence is that of an asset or an enemy ... or merely that of an irritant. Deadpool dances back and forth across the rules of law with maniacal whimsy. He's been both friend and foe to such heroes as Spider-man, Cable, The Punisher, Wolverine and the X-Men. Deadpool's twisted conscience is alternately fed and deprived by his schizophrenic nature. Just like all mercenaries, his motivations seem to be entirely financial. As such, he'll perform jobs for both heroes and villains for a price. However, he has frequently left uncashed the checks paid to him by the X-man, Archangel. Whoever Deadpool is, whatever his motivations, he's a dangerous killing machine with the capriciousness of a psychopath. His abilities with weapons are on a par with such masters as Bullseye and Elektra. He's more than a force to be reckoned with.